On the occasion of your 9th Degree promotion I’d like to express my best congratulations to one of the most impressive TaeKwon-Do masters of the world. There are very few people in the TaeKwon-Do world, who have mastered all the tenets of TaeKwon-Do in their professional and personal life, considering your contributions to its development, spread and acceptance. Courtesy: the courtesy, which you earn from your students, you always and voluntarily give back. Integrity: your humble way of teaching and your willingness of learning from the smallest white-belt are the best witnesses of your mastery. Perseverance: the best proof; the 8th Degree demonstration in Koln, Germany, with a broken foot. Self-Control: nobody trusts you more than your students when you do free-sparring with them. Indomitable Spirit: you have always trusted yourself and God to master every difficulty and thus became a master. By being a real and human leader you have also contributed so much to the development of Unified TaeKwon-Do in Germany, giving everything and receiving the gratitude and the friendship of generations of the German people. I’m proud to say you are my Grand Master and my friend. Since our initial contact with Grand Master Kopperud, he has proven his total and unwavering commitment to the art of TaeKwon-Do. Under his guidance and leadership, all instructors have become more aware of the true essence of TaeKwon-Do, and have passed that knowledge on to their students. 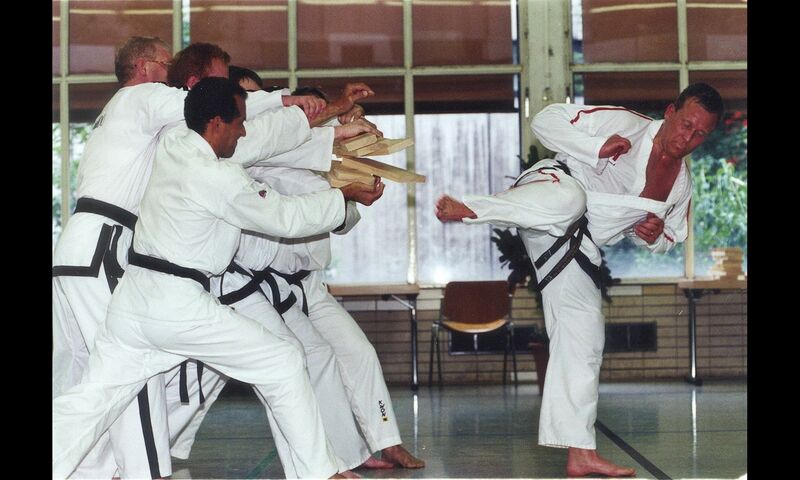 Grand Master Kopperud has demonstrated on many occasions his awesome physical abilities, which have served as motivation for students of all ages. You, GM Kopperud, have proved to be of flawless character with unyielding perseverance and patience in all matters, never losing your temper with the slowest of students, always a benevolent joke on your lips to cheer them up. A role model for TaeKwon-Do generations! GM Kopperud has taken the best from each main style and created UTI; a system and curriculum that is dominant to any that I have seen … GMK has been a tremendous inspiration to me, and has taught me so much which in turn makes me want to inspire and teach my students the same way. Southern Martial Arts (USA) views Grand Master Kopperud as one who displays the epitome of what all martial artists should strive for. It gives us great pride and pleasure to endorse and attest to the promotion of Grand Master Kopperud to the rank of 9th Dan Black-Belt. More impressive than his teaching ability and physical skill (which in my books is second to none) is the way GMK brings Christianity and a sense of family and community to TaeKwon-Do. He has developed a school and a family that is completely supportive and nurturing to everyone who walks into the dojang. 9th Dan Black-Belt, May 3, 2008. Sadly, if some traditionalists had their way, TaeKwon-Do would not have changed since its birth in the 1950’s. This is why we need the pioneer. They have one eye on tradition and one eye to the future. Such a man is Grand Master Kopperud. This is my professional opinion as a TaeKwon-Do practitioner with 35 years experience. It is unique in the world of Martial Arts for the student and master to grow together. Grand Master Kopperud has given generously and selflessly of his time and energy while working with our Mississippi TaeKwon-Do organization. GM Kopperud has been the epitome of a gentleman and has exhibited the tenets of TaeKwon-Do in every aspect of our relationship. It takes a special person to build an organization like Unified TaeKwon-Do International from humble beginnings to the stature it enjoys today. The challenges of such an endeavor are formidable. GMK has persevered and met all the challenges to bring UTI to this point in history. Grand Master Kopperud truly lives the tenets of Unified TaeKwon-Do, and is an inspiration and example to all those who train, study and work with him. Grand Master’s contribution to the creation of Unified TaeKwon-Do’s progressive and evolutionary curriculum has earned him the status of an innovator in our art form. Grand Master Kopperud is one of those very unique people that can challenge people of all ages and abilities to be the very best they can be; in first the art of TaeKwon-Do and second as individuals. Grand Master Kopperud’s drive for excellence and willingness to help so many of us achieve so much more than we thought capable, has made every aching muscle and bruise worth it and more. Grand Master Kopperud has created an environment that has made families and individual members feel very welcome. He has accomplished this personally and by attracting people who have developed into quality leaders, by mirroring his example. As a teacher and a coach, Grand Master Kopperud always leads by example.He works with everyone to accentuate their best traits, while pushing them hard to improve their weak areas … all the while making a student feel positive about themselves. As a martial artist on a purely physical standpoint, Grand Master Kopperud has never failed to impress me. His demonstrations are always crisp, technically sound, and striving to improve upon the precious one. I think it’s a once-in-a-lifetime opportunity – I don’t think many of us involved with Unified TaeKwon-Do International will ever see an event like this again. It’s quite an honor to be here today, and especially being part of it, is fantastic. I think it’s groundbreaking, really, because there’s very few people that have that (GMK’s) rank, first and foremost, and being invited and being a part of this, it’s a great honor when you get an invitation to be a part of something like this. It’s very rare, not only is it rare but for someone of his age to obtain this rank is even more rare. What I think is especially exciting about this event is that he (GMK) is demonstrating his abilities rather than just receiving an honorary degree. Well for me this is a once-in-a-lifetime opportunity to see the promotion to 9th Degree Black-Belt. I never thought I’d see something like this; it’s quite exciting to be here. I’m honored that I can be a part of this. I’m really glad that I have the opportunity to see it. Others may say “it’s about time” but this is going to be fantastic. This is something we’re going to talk to our kids about … and I’ll never see again. Well, to me, as a TaeKwon-Do stylist, this is one of those few times you will ever see this … if we will ever see this again? This is groundbreaking, where a person has founded and fortified and developed his own curriculum, and has expanded it throughout the world, and has shown himself as a 9th Dan, to the world. Within each federation there should technically only be one 9th Dan, per federation, in the world. And for UTI, there’s nobody else that should have it. He’s the man for it.